Advanced new safety testing technology for both general purpose medical equipment and specialist medical devices will be featured at the Arab Health 2016 show, taking place at the Dubai International Convention and Exhibition Center, UAE from the 25th-28th of January. Electromedical test specialist Rigel (Stand MD33) will be showcasing its latest product developments which are designed to make electrical safety testing and patient simulation fast and cost-effective without compromising on accuracy. The company’s latest new product introduction is the SafeTest 60, an entry level safety analyser which has been purposefully designed for more basic and general purpose medical equipment testing where simplicity of testing is of the essence. The new SafeTest 60 tests in accordance with IEC 60601, 62353 and 61010 including equipment, earth and touch leakage as well as insulation and earth bond testing and is suitable for the safety testing of a wide range of equipment used in hospitals and healthcare facilities such as, electronic beds and hoists, as well as infusion pumps, CPAPs and centrifuges. Also on display for the first time will be Rigel’s new range of ‘Plus’ range of testers. 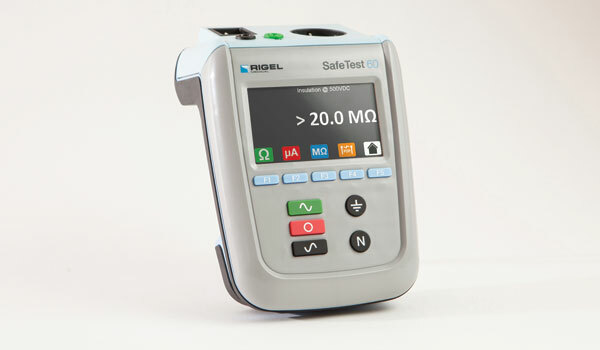 This new introduction sees the well-established Rigel 288 and 62353 safety testers being relaunched as the 288+ and 62353+ models, incorporating special battery-powered leakage tests to enable testing to the full range of international standards to be carried out without compromise on portability or speed of testing. These new hand held instruments also feature special low voltage insulation tests (at 50V and 100V) in line with growing manufacturer's test requirements for 24VDC and 48VDC operated devices such as operating table, lights and mobile X-rays.